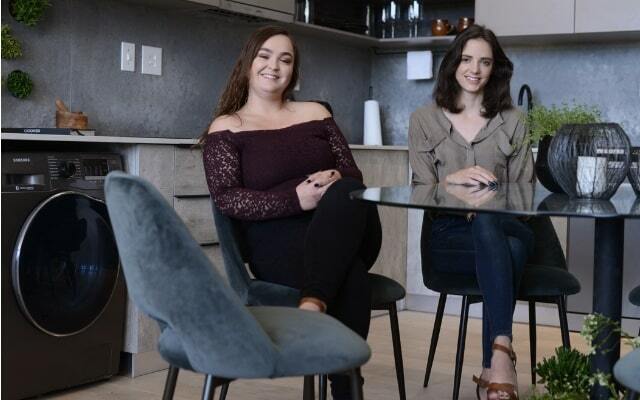 Win a Home is wrapping up on the 13th of December and to celebrate the incredible series we chose to tour the three beautiful apartments that have decorated by this year's Design Duos. The series has been set on Paardevlei Lifestyle Estate in Somerset West. Here, three design teams have each had the chance to interpret one of a trio of identical white-box penthouse apartments in the development. The duo who win will walk away with the title, a huge degree of exposure, and sizeable prize money. Team R&K of Rekopile Belebesi and Koketso Marole are intent on taking top honours, despite only having met three months before the start of the series, but their two unique design styles have merged together beautifully! 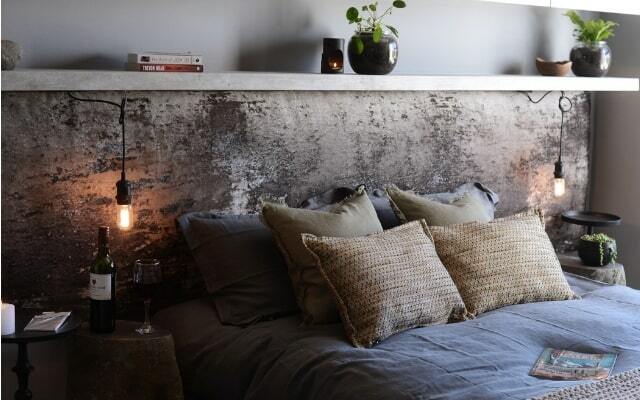 Their increible has influenced their apartment which uses steel, wood, raw elements, blacks and greys is elegant and striking. 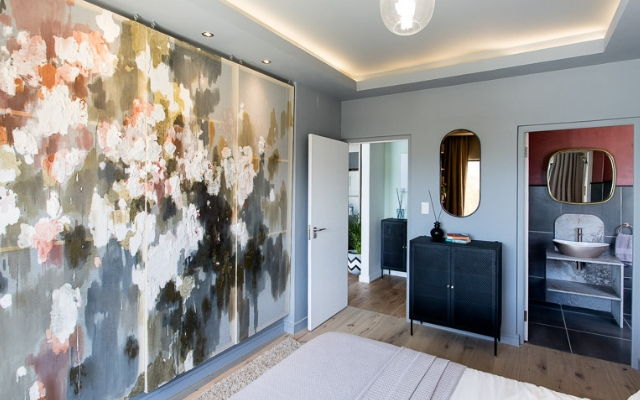 Their take on the master bedroom is dominated by a vast, floral canvas, created by talented artist Emma Norse. Their appreciation for local art is ideal, and the Paardevlei Lifestlye Estate offers the Lionel Smit art gallery just a stone's throw away. 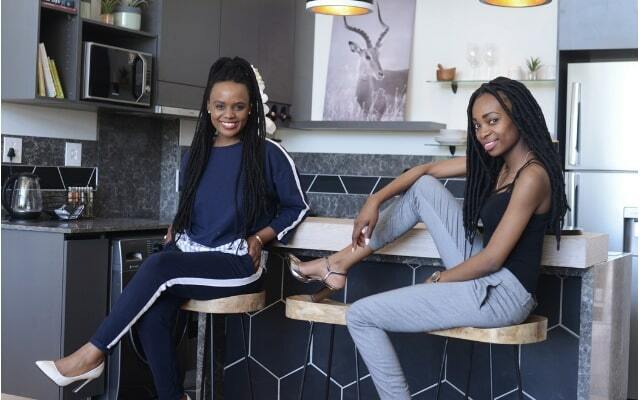 As supporters of local artists, Rekopile and Koketso were inspired to have the studio of this renowned painter and sculptor on their doorstep for inspiration. His process is adaptive, inventive, and physically engaging – just what this design team seem to have achieved. They needed to- as their competition includes the dynamic Melissa Oosthuizen and Sinead Turner. The team have a genuine love of beautiful interiors and nature, and derived their name Perma Peeps from permaculture which is essentially designing with nature, ecosystems and zero wastage in mind. Practically it can be seen in the greenery, different recycling and composting options while making a space that is health for humans and for nature. Having won the master bedroom challenge the two wanted it to be muted, soft and natural while encoprorating African nature. 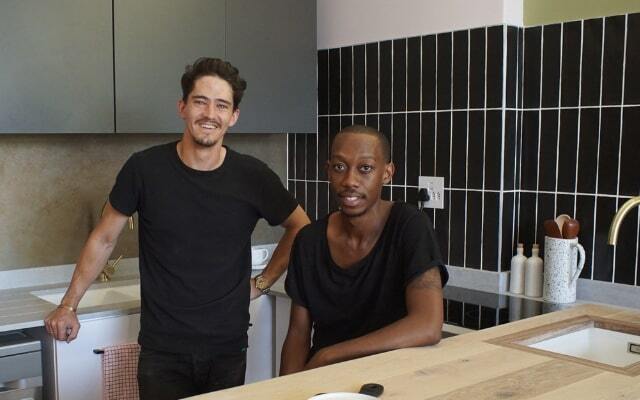 The third team competing for this year’s Win A Home title are friends Kehumile Mate and Nicholas Smit who met at deign college and always wanted to join creative forces. They were inspired by different elements coming together and contrasting, as well as a mesh and woven textures theme that flows through the home, along with their own natural edge and style. 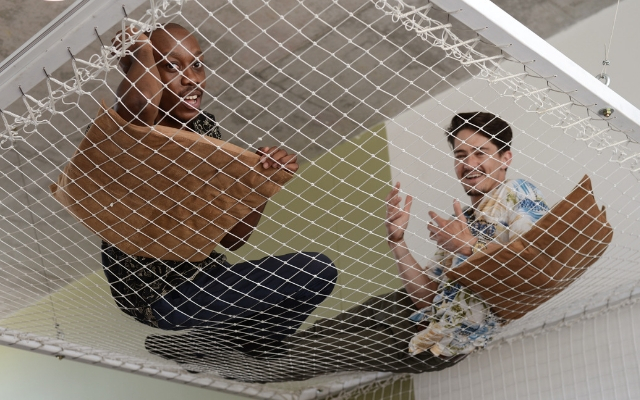 The team also played with different levels and volume in the apartment, such as the aerial plant feature in the kitchen and the amazing hammock in the lounge. Whoever wins this year’s viewer’s competition gets to own their choice from the three penthouse designs. With it comes access to nearby Strand beach, where the ocean is the warmest in greater Cape Town. As for these design teams, our visit was a rare opportunity for leisure in what has been three months of proving their mettle to both the judging panel and tv audiences nationwide. For Top Billing viewers interested in whose penthouse will take top honours, the Win A Home Grand Finale broadcasts live on Thursday evening the thirteenth of December, at 7:30PM, here on SABC3.